The total electric energy consumed by an individual (especially houses) measured in kilowatt-hour is called electric power consumption. All the power companies install a meter in their customer's house so that they can charge according to the electric consumption. Those installed meters measure electricity on kilowatt-hour (KWH). In normal terms, we say 1 unit for 1 KWH. It is actually the amount of power used for a certain period of time. For the easy purpose, we say an electrical appliance of 1000W consuming power for one hour will consume 1KWH i.e. 1KWH = 1KW x 1hr. So, to calculate total power consumption of a home, we need to know the power of each equipment, number of equipment and time they run. Since all the appliances are not run at the same time and same period of time it is better to calculate power consumed by each appliance and add all at last. If a home has 10 tube lights of 30W that run for 4 hours daily, 5 television of 200W running for 3 hours daily, 2 irons 1000W 1 hour weekly. Calculate total amount to be paid if the cost per unit is Rs. 7. To calculate total power consumption of a home, we need to know the power of each equipment, number of equipments and time they run. 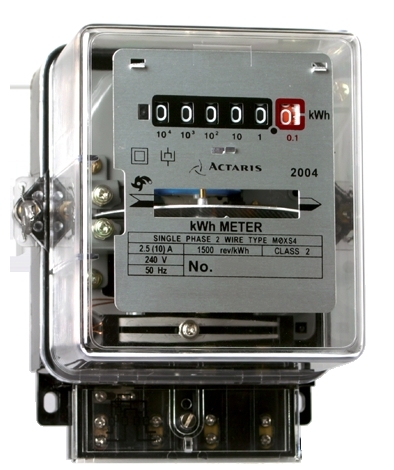 Meters measure electricity on kilowatt-hour (KWH). The frequency of electricity distributed in Kathmandu is 50 Hertz. What does it mean? The frequency of electricity distributed in Kathmandu is 50 Hertz implies that the polarity of this current is alternated at the rate 50 times a second. Define one kilowatt hour of electricity. One kilowatt hour of electrical energy is defined as the energy consumed by an electrical appliance having power rating of one kilowatt for an hour. Prove that 1 kwhr = 3.6 × 106 joules. What is meant by electric power? The power of an electric machine is the rate of doing work per unit time. Actually, the rate of converting energy in unit time is called electric power. The electric power is measured in watt. A bulb of 100 watts and a heater of 1000 watts are used for 3 hours daily in a room. What will be the increase in the reading of sub-meter of that room after 15 days? Therefore, the electric unit consumed in 15 days of the room is 49.5 units. 10 electric bulbs of 100 watt are used for 6 hrs and 2 electric heaters of 2 kw are used for 2 hrs. Calculate the total consumption of electricity for a day. 6 kwhr + 8 kwhr = 14 kwhr = 14 unit. The electricity authority charged the cost of electricity per unit is Rs. 6.50. If in a house 4 bulb of 100 watt glow for 5 hours a day. Find the cost of electricity for 1 month. The installed meters measure electricity on ______. What is not necessary to calculate the total power consumption? An electric bulb can be worked from ______. If 105 J of energy is used in 103 s, what is the average power consumption in watts? The potential difference across a resistor is 12 V. When a current of 5 A is flowing through this resistor, what is the power used by the resistor? Any Questions on 'Electric Power Consumption '?